Die Arbeit mit Ausgaben und Aufnahmen der Musik Ascanio Mayones hat mich dazu geführt, ein Cembalo Cromatico von Denzil Wraight rekonstruieren zu lassen. Solche Instrumente mit 19 Tasten je Oktave, die auch von Praetorius im zweiten Band seines Syntagma Musicum besprochen werden, waren um 1600 vor allem in Italien relativ weit verbreitet. Die Beschäftigung mit diesem Instrument bringt natürlich etwas erhöhtere Aufnahmefähigkeit in der Frage Stimmung. Beim Cembalo cromatico können zwar sämtliche Durterzen rein gestimmt werden, jedoch nur auf Kosten der engen Quinten. Das von den Terzen geschmeichelte Ohr wird bald mit diesem Zustand unzufrieden. In der Suche nach einer Lösung dieses Problems habe ich während der letzten Jahren versucht, eine neue Tastatur zu entwerfen. In der zweiten Hälfte des 16. Jahrhunderts gab es verschiedene solche Versuche. Auch Francesco Salinas hat eine solche Orgel bauen lassen aber leider ist uns Genaueres darüber nicht überliefert. Ich habe schon eine Tastatur mit 22 Divisionen machen lassen und darauf ein Jahr lang gespielt. (Dieses hatte folgende verdoppelte Töne, jeweils um ein sintonisches Komma voneinander entfernt: D, G, H, Fis, B, und dazu noch alle Subsemitöne des chromatischen Cembalos außer Eis und His.) Dieses hat sich als hochinteressantes Improvisiergerät bewertet. Jedoch auch nach langer Zeit ist es fast unmöglich, auch eine relativ unkomplizierte Komposition bequem spielen zu können. Meine letzte vereinfachte Fassung, die nicht zu schwer zu spielen ist, verzichtet auf Verdopplung von H sowie auf einige Subsemitöne (Ges, Ais). Somit hat man auch 19 Tasten je Oktave. Diese Tastaturen sind von Willard Martin in Pennsylvania ausgeführt worden. Ich hoffe, daß dieses Instrument auch eine Anregung für zeitgenössische Komponisten werden wird. Some instruments were therefore provided with extra keys, the earliest case known to us being the organ in Cesena Cathedral (1468). During the 16th century many Italian organs had at least two extra keys - and of course the corresponding pipes - in the central octaves; these were almost always to provide ab/g# and either c#/db or d#/eb. While harpsichordists could retune such notes easily - both sharps and flats would not usually have been required in the same work - in time harpsichords followed suit. The process had been developed by the middle of the 16th century to provide both sharps and flats for almost all of the natural keys on the keyboard; this meant doubling each of the black keys and also inserting a half-key between b and c, and between e and f; this instrument with 19 keys to the octave was known as the cembalo cromatico or chromatic harpsichord. Nicola Vicentino and others designed instruments with as many as 31 divisions to the octave known as the archicembalo. (This extended the logic of the system to include both double sharps and double flats.) Luzzasco Luzzaschi played regularly on the archicembalo at the ducal court in Ferrara in the late 16th century. The chromatic harpsichord with 19 keys to the octave was relatively common in Italy up until the 1640s. While it owed its raison d’être to the wish to be able to play ordinary music in any key, thus satisfying the needs of singers and other instruments (pitch standards at the time varied enormously in Italy) the possibility of modulating or juxtaposing flats and sharps opened new vistas. Apart from the obvious role of accompanying singers - the chromatic madrigals of Gesualdo come to mind - it was also used in a solo capacity, as is shown by the fact that some compositions for such instruments even found their way into print. These include two Toccatas by Ascanio Mayone (1609), one by Giovanni Maria Trabaci (1615) - published in Naples - and a Sonata stravagante…sopra Ave Maris Stella, published in Palermo in 1641 by Gioanpietro del Buono. Mayone also wrote pieces to demonstrate the possibilities of an enharmonic (31-note) clavichord described by Fabio Colonna in his book La Sambuca Lincea, published in Naples in 1618; it is interesting that these examples were provided with sacred texts, the choice of which underlines the rather lugubrious nature of this extreme chromaticism. Editing and recording the music of Ascanio Mayone 20 years ago led me to commission from Denzil Wraight a reconstruction of a cembalo cromatico with 19 keys to the octave. Unfortunately no such instrument is known to have survived in its original condition. There is however a detailed description by Michael Praetorius of a chromatic harpsichord or cembalo universale as he calls it – in his Syntagma Musicum (Vol ii, 1618). The instrument, which can be heard on the cd Consonanze Stravaganti, is based on that described by Praetorius, although it does not have the transposing keyboard that Paetorius describes. Subsequently Willard Martin made a similar but larger instrument that transposes to 12 different pitches (Praetorius names 7 pitches). Whether pure meantone tuning or any variant is used, the fifths are always small in order to accommodate pure or good major thirds. It is possible to tune 19 equal intervals giving both fifths and major thirds that are 1/3 comma smaller than pure, while the minor thirds are virtually pure. This tuning is described by Salinas. An instrument similar to Vicentino’s archicembalo is Trasuntino’s clavemusicum omnium tonum of 1606 preserved in Bologna. (There is a working copy in Germanisches Nationalmuseum, Nuremberg.) This instrument is uncomfortable to play, since a single keyboard contains 31 keys per octave. 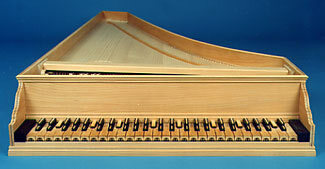 Vicentino’s solution was to distribute the pitches over two keyboards, the lower of which is identical to that of the cembalo cromatico.